I know there are many countries (and probably my friend Marlaina) who eat the feet (and other parts) parts of a chicken that I'd never even consider buying and would throw away if I found them attached to my chicken. 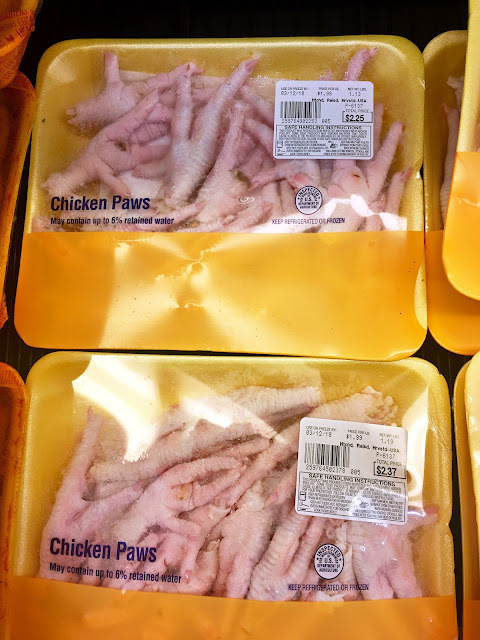 I don't usually see the unusual parts at my grocery store, but today when I was shopping I saw a package of Chicken Paws. My brain exploded a little. Chicken PAWS?? Thank God for Google. Because Google let me to this. Gag. Apparently, the United States Department of Agriculture has specific descriptions for both paws and feet (pages 78 and 79 of this document, designation numbers 71801, 71802, 71803, 71804). Scrolling through the pages I was amazed at how specific they get with poultry. But honestly, really, I don't care what you call them. You couldn't pay me to touch them, let alone eat them. I don't even think I could bring myself to use them for stock. I've gotten squeamish in my old age. I don't like to touch icky stuff. I'm still traumatized by being forced to try liver when I was a child.